While it’s no replacement for a parent’s loving arms, this automatic baby swing (check out our top picks) can provide comfort and entertainment for your child when you’ve got your hands full during the day. It’s an essential baby gear that would allow you to get a few things done, knowing that your child is perfectly c]omfy and safe in their own little space. The Spolor Baby Cradle Swing is packed with features to soothe and calm your little one, from gently rocking them side to side, protecting them from mosquitoes, to playing their favorite lullabies. It features 3 speed settings, a swing timer, and versatile power supply options. The swing is designed with solid and durable frames made of steel and polyester fiber. It can support up to 50 lbs and is suitable for babies from 0 to 2 years. Anti-slip pads on the base of the frame prevent it from sliding so you can place it on all types of flooring. Keep your child secure with the in-mattress seat belt which keeps them in a flat lying position. It also helps protect their back and prevent their spine from being deformed. The mattress is firm enough to provide enough support for your baby’s back but soft enough to provide maximum comfort. Attached to the mattress is an ergonomic head pillow which provides support for your child’s soft neck and two side pillows to keep them from rolling all the way to the sides. It comes with a removable mosquito net to protect your baby from insects that could cause rashes and diseases. You can quickly attach and detach the net so it’s easy to clean. 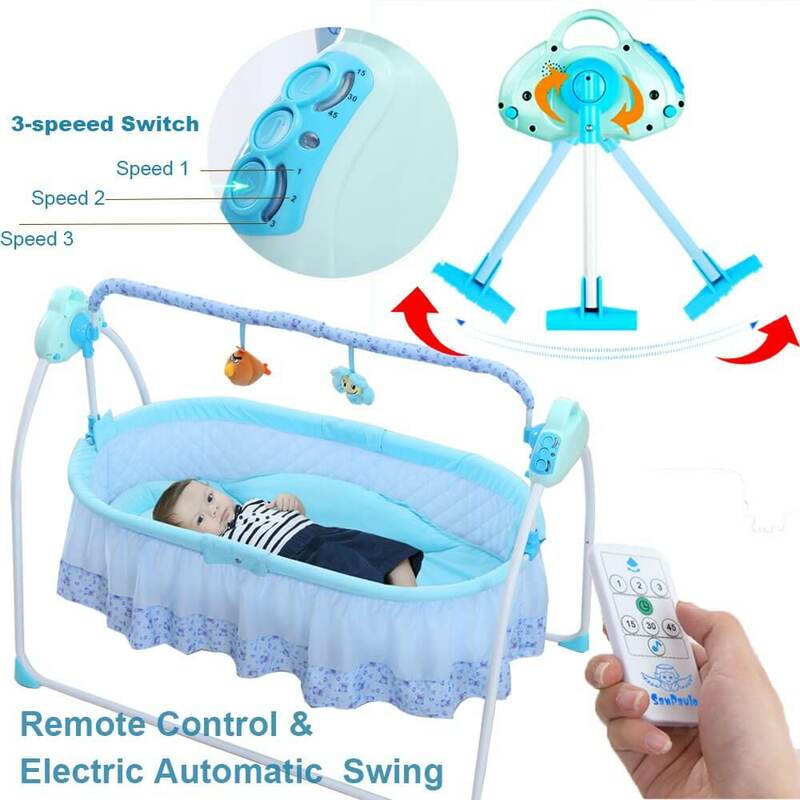 This electric automatic swing features smart and simple operation. You can learn how to operate the swing in just a few minutes. No complicated settings to deal with. 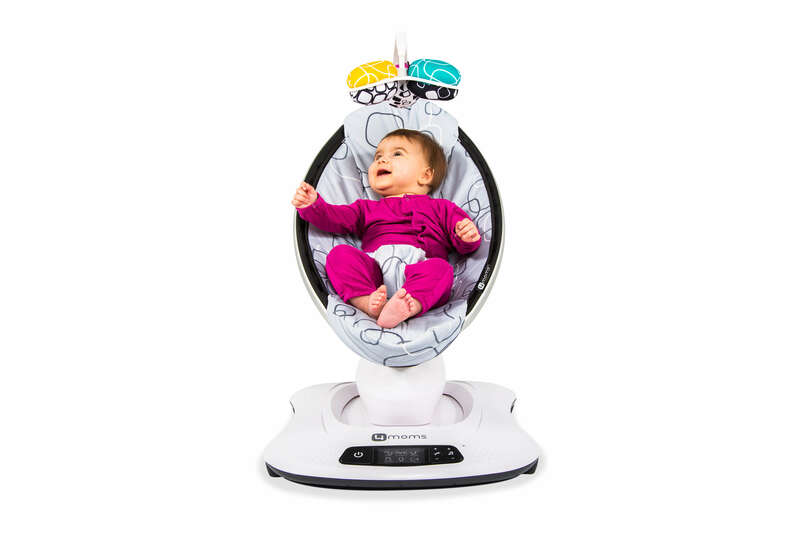 Change the swing’s speed, set the timer, and choose from a variety of soothing tunes with a few simple buttons. You can also change the rocking mechanism and direction of the swing with a single switch. The timer, speed, and music toggle buttons are located on a control panel on one end of the swing while the swing mode switch is on the other end. To make operation even more convenient, you can operate the swing and toggle through settings within 5 meters using the remote control. Simply press any of the 3 speed buttons to change the swing’s speed. There is one green button that allows you to turn the timer on and off and 3 buttons for 3 different timer settings. The button on the bottom lets you toggle through the swing’s preinstalled music playlist. You can select from up to 3 speed settings which have all been tested and proven safe for babies. Use the lowest speed setting for when your child is asleep and the highest setting to lull them to sleep. The medium setting is best for when your baby is awake and playing in the swing. Making use of the different speed settings is a great way for you to customize your baby’s experience. Test which ones they like the best and which are most effective for different purposes. Set the timer to make the swing automatically stop rocking after a certain period of time. You can choose from 3 timer settings from 15, 30, and 45 minutes. This will ensure that your baby is not in a constant rocking motion for a prolonged period of time. Stopping the swing after they have gone to sleep allows your child to have a deeper and more restful sleep. Your baby will wake up feeling refreshed and in a great mood! 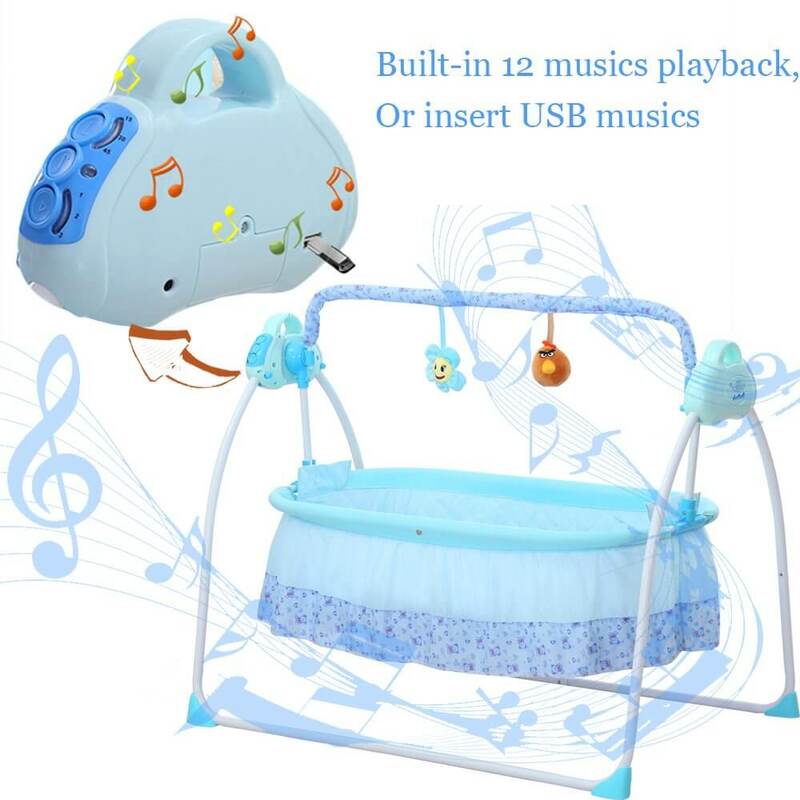 The cradle swing is preinstalled with 12 different tunes that will entertain and soothe your child. You can select an upbeat tune to keep them from being bored when they are up and about or a slow lullaby when you want to help them sleep. The great thing about the Spolor Baby Cradle Swing is that you can also insert your own USB drive and play your own collection of nursery rhymes. Cute plush toys hang from the top bar of the swing to keep your little one smiling when they are awake. The Spolor Baby Cradle Swing is designed with lightweight frames with locking casters for greater mobility. Easily move the swing from one room to another inside your house or fold it up when you want to put the swing in your car and bring it to another location. It comes with a 2-section storage basket for all your baby’s essentials so it is perfect for traveling. You can power up the swing in a variety of ways. It comes with a regular power adaptor so you can plug it into a typical wall outlet or you can use 3 AA batteries. There is also a USB port which allows you to connect the swing to a power bank. 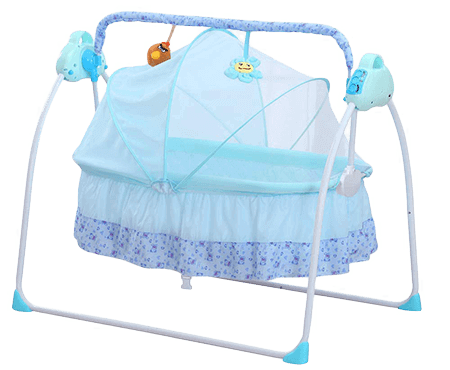 The Spolor Baby Cradle Swing comes in 3 colors: blue, brown, and pink. 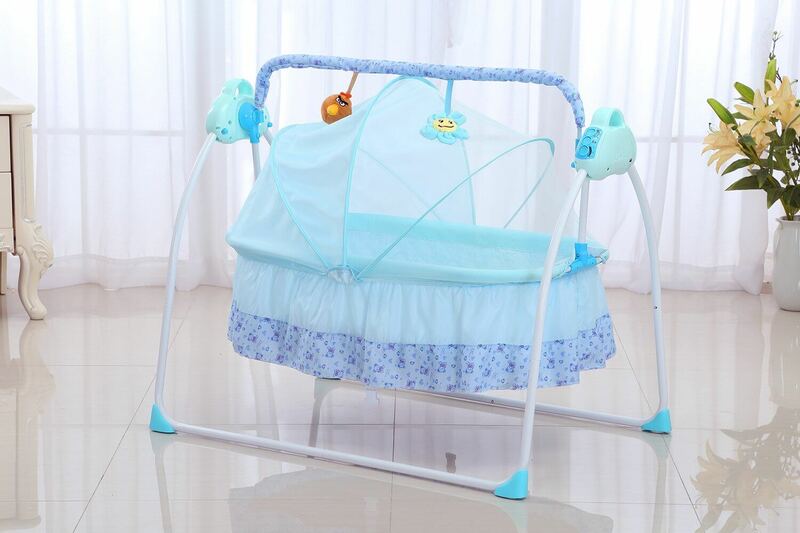 The cradle looks like a traditional bassinet which would look great in any baby room and the additional removable mosquito net makes the swing look extra charming. 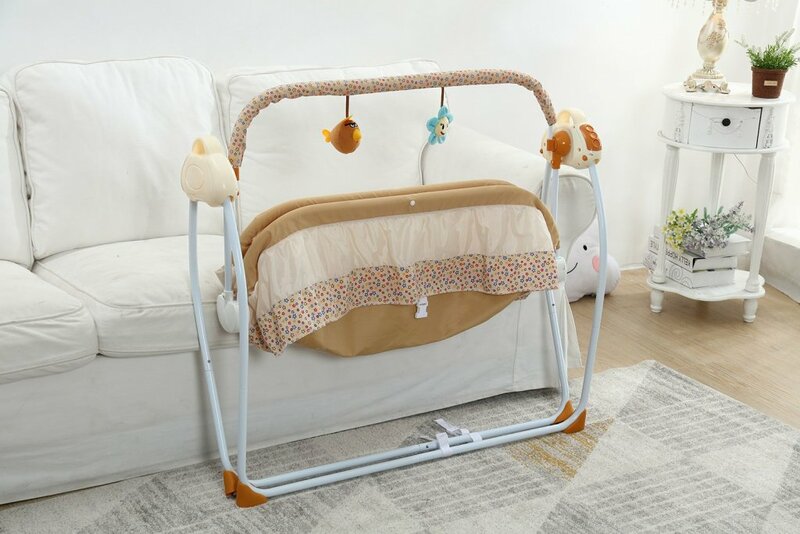 The Spolor Baby Cradle Swing is packed with features that will keep your baby entertained when they are wide awake and keep them relaxed and comfortable when they are asleep. What makes this electric automatic swing stand out is its easy operation and versatility. 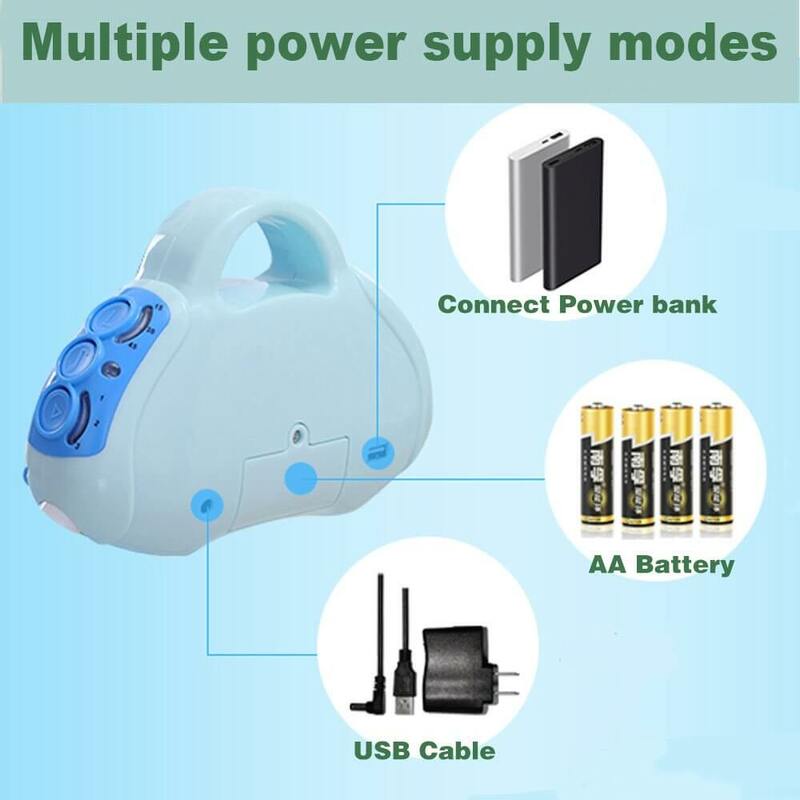 The option to plug it directly to a power outlet or use batteries or even a power bank to operate it makes it super convenient. The ability to play your own music using the USB port is a great plus. It is a charming swing with a traditional design and features that would keep both you and your baby in a great mood all day.